John’s also one of the first people I called when I found out Noah was born with Down syndrome. I consider him a great friend and enjoy getting to hang out with him and his equally as awesome family. 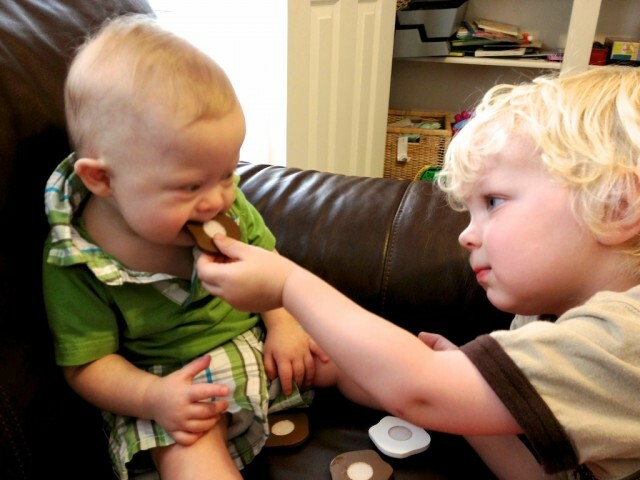 Charlie serving Noah some good (wooden) cookies! John’s son Charlie is a few years older than Noah, doesn’t haven’t Down syndrome, and completely adores our son. It’s so much fun watching them play together. As I was watching these two kid-o’s play today it made me think about how blessed Noah is to have a friend like Charlie in his life. 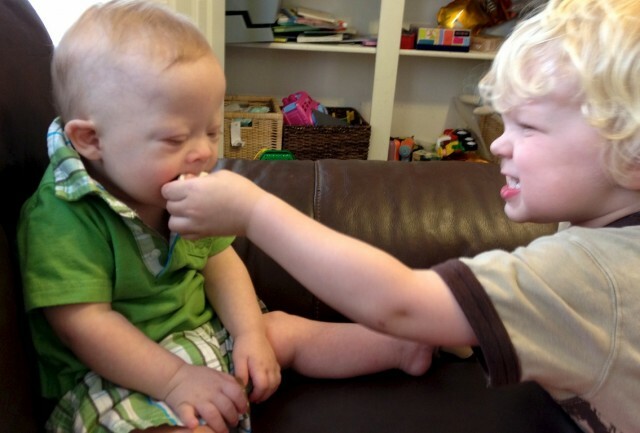 I know that Charlie is only a toddler and doesn’t have any idea that our son has Down syndrome, or any idea that Noah is any different than any other of his play friends. But today there was no comparing, no misunderstanding, no confusion, no awaked moments….just two little boys playing and having fun. To my friend’s 3 year old son, Noah was just Noah. Childhood innocence may face, but the love of cookies never will. But this will change one day. One day Charlie will begin to wonder why Noah is different. Charlie will begin to ask questions. Childhood innocence will fade. Thankfully I know John and his wife well enough to know they will handle Charley’s questions well. They will teach their son about Down syndrome. They’ll teach their son to love and respect, and include people that are different than he is. And Charlie (hopefully) in turn will help other people (who may not have parents like he does) to do the same as he grows up and goes into the world. Yelp, children like Charlie can grow up and change the world. Thankful for fathers who teach their children well. The Charlie’s of the world grow up helping others to exchange cycles of ignorance with cycles of acceptance. Charlie is serious about his cookies! I really hope Charlie and Noah stay friends as they get older. I hope that there are lots more days where Charlie and Noah just play. Just have fun. Days like today where Noah isn’t treated as the poor little kid with Down syndrome, but as just a regular little boy who likes playing with wooden cookies just as much as the next kid. I hope one day Charlie calls Noah up and asks him to go to the movies, or to the high school football game, or to come over and just hang out. I hope Charlie continues to look more at what he and Noah have in common than what he and Noah have in different. I hope Charlie always sees Noah not as being ‘disabled‘ but as being able. Very, very able. I hope these guys eat cookies together for many years to come. I hope Noah has lots more friends like Charlie in his life. Lots more friends who see him as a peer. Friends who love him, accept him, and show him that he is valued. That he is able. That Down syndrome isn’t that big of a deal. 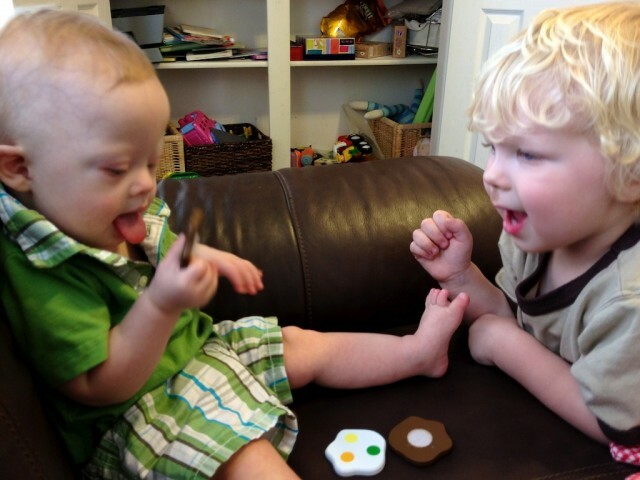 I hope every person born with Down syndrome has a friend like Charlie. I have three older brothers and 7 nieces and nephews under the age of 8 )my Jack is 9 mnths). I was thrilled to think that Jack would have a “built-in” set of friends like Charlie…friends that would always love him, right from the start, and not see him the way society one day may see him. I told my brothers how lucky Jack was to have their children in their lives, and they all replied, with tears, that they feel their kids are actually the lucky ones….they feel so blessed that their children have JAck in their lives. Jack has already blessed us and brought more joy in the past 9 months than “typical” kids may ever!! I think my middle daughter is her Charlie. She watches her plays with her sings and if she cries she’s always there for her. They will be close. I teach PPCD (Preschool Program for Children with Disabilities) in a 2A school district in Texas. I absolutely love my job. One of the benefits of being in a small town, is that the kids all grow up together. All the kids at my primary school know my students’ names. They are very protective of them and very kind toward them. They are accepted as themselves at a young age, and this will continue throughout their school years. It seems like in each grade level there are a few students who befriend at least one of my students. They serve as mentor, teacher, protector, helper, and most important, friend! My daughter’s class has a young man named, Chris who has Cerebral Palsy. They loved, protected & helped him all the way through school. He rolled across the stage at graduation with his classmates giving him a standing ovation. I am the legal guardian of my nephew, Wesley. He came to live with me at 19 years. My husband is from a city & was concerned over how he would be treated. I told him, no worries. Wesley had gone to school off & on his whole life. Well, after the 1st week, he had his nickname, WesBuck. He is 25 years old now. He is the biggest Bulldog fan & they have him on the radio before each football game to give his predictions. It’s always the same response & the fans love him. He’s our “Radio” of the town. There need to be more “Charlies” out there. We are fortunate to have many “Charlies” in our lives. Both my kiddos have DS and cousins are great but not always available to be playmates. We are fortunate to have many friends whose children of all ages infant to young adult) accept my kids just as they are. I think it is important for all kids, disability or no disability, to have friends of all kinds…disabled and non disabled. In my daughter’s 5K class almost all her class mates will watch out for her and go out of their way to play with her. It is the best thing to see and watch! We all learn from each other and some times the things we adults learn from watching our children and their friends can be the biggest lessons of all. I hope Noah has as many Charlies in his life as my kids do in theirs. My daughter was born the same day as her cousin, even at the same hospital. I bet she will be her Charlie they already share toys. We actually have two awesome chromosomers by fluke or luck! My baby girl with three 21’s, and my niece with Turners syndrome. We’re a family of Charlies thanks to these 2 princesses, and we’re so lucky! I was the “Charlie” in my sister’s life. I adored her—never knew she was “different” until I went to school and the kids there asked so many questions I couldn’t answer. She was the best thing that ever happened to me. I am the person I am today because of Roberta. She’s waiting for me in heaven now. Until then, I’ll keep loving all the “Noah’s” in the world. My hope for Noah and for all children is that they all get to be a Charlie at some point in their lives. What a great post!! I think that when Charlie grows up, he’ll realize that he was the blessed to have Noah in his life. We have some really good family friends who have told me what a difference my sister has made in their life. Our families have been vacationing together since before us kids were all born so they’ve grown up with me and Ellen practically as sisters. It’s reassuring to know that these life-long friends will always have an eye out for my sister and that my sister has others she can rely on, who see her for her and not for her DS. I know that NOah and Charlie will develop the same connection, and it will be a beautiful thing to watch them grow up together! My little Kayden is a special needs child (he doesn’t have Down Syndrome) but has a chromosomal 5 disorder. He is the sweetest little boy you ever wanted to meet. His best friend in the world is a little boy named Benito (Benito has Down Syndrome), they are just the most adorable kids in the world. I was blessed to have a brother with Down Syndrome who was a joy to all who met him. My brother Charlie, sadly is no longer with us but lived a happy life into his 50’s. Charlie taught me and my entire family patience and unconditional love….he truly was a blessing to our family. I love this! My son Ian has DS and will be 3 next month (yikes!) and our older son Joey is 6 and 1/2. Our pediatrician told us to wait until Joey asks before we “tell” him that Ian has DS because he would not want Joey to think that Ian is sick, etc. 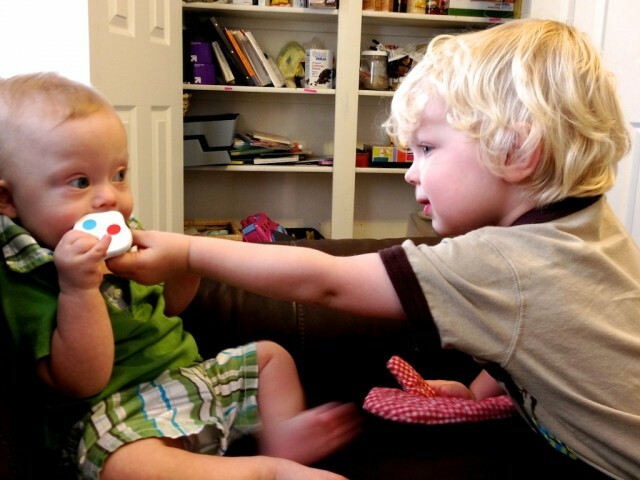 And the bond between my sons is something I have never seen in siblings. Their fierce love for each other, their indescribable bond, how they miss each other when they are apart… Ian runs up to Joey in line and they give each other a big hug at the end of the school day. 🙂 I told my husband the other day how nice it is that Joey gets to know Ian and love him before he knows about the DS… how he just sees his brother. What a blessing! My daughter, Meredith, has Paige…Paige (now 16) and has been coming to play with Meredith almost weekly since Paige was 7 and Meredith only 2…Meredith is now 12 and thinks of Paige as her best friend. Paige knows Meredith so well and is incredibly loving and patient with her and makes her feel so special. Meredith, also, has 5 wonderful older siblings that adore her…she’s a blessed girl! I work with a little one with DS- and her playschool classmates adore her. They fight over who gets to sit next to her, who gets to hold her hand in line, who gets to be her “buddy” at centre time each day, etc. If she’s a little behind the group someone inevitably comes back for her- not because they’ve been prompted to- because they notice her absence and want her there. She recently learned to jump on two feet independently and now it’s the “cool thing” to do to jump with her. They’ll even prompt her to ask the teacher or me for a break when she becomes overwhelmed. She has a classroom of Charlies! hi my son is three and a half. he is also lucky to have some wonderful friends who play with him include him in their games. and his close friends are also eger to learn sighn. he has always been treated the same as all of his friends. hudson loves to play with jimmy maddy summer shayne and georgie. he also has many other friends at his nursery. he wi be attending a mainstream school along with all of his friends. My grandchildren Patrick and Caitlin have their cousin Emma, who is 5 years older than Patrick and 6 years older than Cait. She has heard the words Down Syndrome used in adult conversation, and she comes to the Buddy Walk every year. But she really doesn’t see the difference between her and all the other kids – they are all just kids. She used to think DS is a heart condition, because Patrick had to have surgery. She provides a lot of motivation for Patrick to move and play, and I am sure she will do the same for Caitlin. James has many people in his life who accept him for sure! With his facebook page the community knows all about him! I also take care of a couple of girls who love James, but my prayer is for friends who truly accept him! Great post! And I have to add that watchin Noah reminds me of my little James and it just brings tears to my eyes. I want to just hug that little guy. I want so much to make a difference like you and your wife are. I live in such a small community but I will find a way! Sorry…didn’t finish. They made sure not treat him differently. But yet help him when he needs assistance in order to be a part of the group. He is able to keep up with his peers in nearly every aspect of his day…as long as he has his “talker” with him. I agree whole heartedly. My twins have some life long friends, both typical and special needs. They also have some new typical friends. They are in middle school right now and making new friends is really hard anyway, but for my girls it is nearly impossible. At our church there is a young lady, just a year younger, who reached out to them. She helps them if they need it or just hangs out with them. She told me, “I don’t care if they have special needs, they are nice girls and I like beint with them” What a blessing! I hope my kids are the “Charlie” in their new cousin Cavan’s life. My nephew Cavan is just two weeks old and has Down syndrome. My kids are so blessed to be given the gift of Cavan! I love seeing “Charlie” love on Noah. Charlie has a tender and accepting heart. It has warmed my grandmother’s heart to see the love of two children so pure and untainted by the world’s many prejudices. May it continue to span the years in to adulthood and be a shining light to everyone in their spheres of influence. Good friends are wonderful at any age. When Billy (who is 56) began working at Food City, Jonathan became his best friend. He was like a big brother (although much younger than Billy) who taught him the ropes with little tips like “don’t eat onions for lunch” and “don’t pack bread on the bottom of the bag.” I loved to see them bringing in buggies together, laughing and teasing while getting the job done. Unfortunately Jonathan moved to another town but they still talk on the phone, still laughing and teasing, and Jonathan comes for lunch whenever he is in town.He made all the difference in Billy’s adjustment to a new home and a new job. My younger son was a reverse-mainstreamed student in a special ed preschool class. He was well-liked by everyone! Girls, boys – disabled or not. He’s just got that winning personality that everyone loves. He even had a little friend who he adored in preschool (though she’s fallen by the wayside now since he’s a year older than her) that was in a wheelchair – and I’ve got pictures of the two of them holding hands at the zoo field trip their class took! ABSOLUTELY precious and totally innocent, beautiful friendship. He’s at the age now where girls are “icky” but he gets along so well with others and the kids in his class that might be “differently-abled” seem to flock to him. He’s kind, generous, helpful and so very sweet. I hope he stays this way. Those little Charlie’s of the world can grow up to be older Holden’s of the world! my son is 10 and is still that same, sweet and kind and helpful kid he was when he was tiny. Well, I would have to say that Jack’s 2 older siblings are wonderful friends to him. Gently and caring one minute, kick to the head and pushed off the couch for the coveted space the next. A couple of summers ago, my husband and I decided to have “the talk” with our two oldest to fill them in on what made Jack “special”. We wanted them to know the term “Down Syndrome” before someone used it or misused it with them at school. By the end of the conversation, the only question they had was “so, is there something special about me too, Mom, Dad?” I just had to laugh…what is the big deal? They see nothing different in him. Thanks for this post, Rick. I want to keep my “faith-like-a-child” spectacles clear of dirt and you have helped me rally again today! Gunnar is the Noah is our life.. And let me tell you WE love him.. He is 8, and my boys are 5,5, and 3… There is actually no other child we have play dates with.. Gunnar and Brody,3 are the best of friends.. Merrick and Maverick love him too.. Merrick has a hard time slowing down for more than 30 mins at a time.. Gunnar does not mind… when things get to active for him.. he backs off and watches… I love to watch the of them interact.. pretty soon Maverick or Merrick brings Gunnar back into the group. OR Brody and Gunnar are talking among them selves… Only they understand what they are saying at that point.. I love special needs children and adults. They Love everyone..all they ever want is a hug.. The key is the normalcy. We’ve tried to create an environment where my 16-month-old’s Down Syndrome is as everyday and normal as is blue eyes, or my brown. He has four older siblings who are full-gas, and while dry patient with him, INSIST on his involvement in everything mom and I will tolerate. Ultimately, we’ve tried to create a place where none of us can use his DS as an excuse. Not me. Not him. IMHO, when friends and even family see us NOT making a “big deal”, or treating him with lower expectations, they relax and do the same. My son Brandon was born with Down’s Syndrome and he is 13. He has two older siblings. My daughter Heather, 24 and Andrew, 19. Heather was much more accepting of her brother than Andrew ever was. I think he was more jealous. I tried to explain to him that he was not going to be able to be like other kids his age, and his needs were different. Heather doesn’t live at home anymore but talks to him on the phone (what little he can say, he’s still hard to understand.) She’s getting married next month and doesn’t even live in town.Maybe sees him once a month. Andrew still lives with us. He loves school and enjoys being around his friends there. Summers are hard and some of the local summer programs for kids with DS still are strict about a lot of things so he has to stay at home with me. I know he misses the interaction with kids his own age. Hopefully, he will have a good friend like Jack one day. One of the beautiful things about friendship is seeing a person the way God created them to be. I hope Noah continues to be surrounded by people and communities (school, church, family, etc.) who see his gifts and strengths and welcome him with open arms.